Virtually every aspect of the manned and unmanned US space program – including NASA, other government agencies, private aerospace company’s and crucially important US national security payloads – are highly dependent on Russian & Ukrainian rocketry and are therefore potentially at risk amidst the current Crimea crisis as tensions flared up dangerously in recent days between Ukraine and Russia with global repercussions. The International Space Station (ISS), astronaut rides to space and back, the Atlas V and Antares rockets and even critical U.S. spy satellites providing vital, real time intelligence gathering are among the examples of programs that may be in peril if events deteriorate or worse yet, spin out of control. The Crimean confrontation and all the threats and counter threats of armed conflicts and economic sanctions shines a spotlight on US vulnerabilities regarding space exploration, private industry and US national security programs, missions, satellites and rockets. The consequences of escalating tensions could be catastrophic for all sides. First, let’s look at America’s dependency on Russia regarding the ISS. The massive orbiting lab complex is a partnership of 15 nations and five space agencies worldwide – including Russia’s Roscosmos and the US NASA. 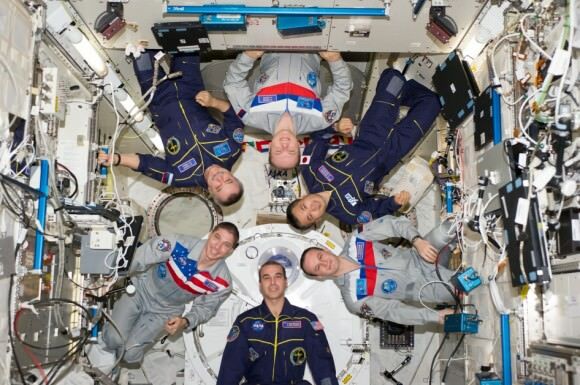 The station is currently occupied by a six person crew of three Russians, two Americans and one Japanese. Since the forced retirement of NASA’s space shuttle program in 2011, America completely lost its own human spaceflight capability. So now the only ticket for astronauts to space and back is by way of the Russian Soyuz capsule. American and station partner astronauts are 100% dependent on Russia’s three seat Soyuz capsule and rocket for rides to the ISS. Russia has a monopoly on reaching the station because the shuttle was shut down by political ‘leaders’ in Washington, DC before a new U.S. manned space system was brought online. And congressional budget cutters have repeatedly slashed NASA’s budget, thereby increasing the gap in US manned spaceflight launches from American soil by several years already. Congress was repeatedly warned of the consequences by NASA and responded with further reductions to NASA’s budget. In a continuation of the normal crew rotation routines, three current crew members are set to depart the ISS in a Soyuz and descend to Earth on Monday, March 10. Coincidentally, one of those Russian crew members, Oleg Kotov, was actually born in Crimea when it was part of the former Soviet Union. A new three man crew of two Russians and one American is set to blast off in their Soyuz capsule from Russia’s launch pad in Kazakhstan on March 25. The U.S. pays Russia $70 million per Soyuz seat under the most recent contact, while American aerospace workers are unemployed. The fastest and most cost effective path to restore America’s human spaceflight capability to low Earth orbit and the ISS is through NASA’s Commercial Crew Program (CCP) seeking to develop private ‘space taxis’ with Boeing, SpaceX and Sierra Nevada. Alas, Congress has sliced NASA’s CCP funding request by about 50% each year and the 1st commercial crew flight to orbit has consequently been postponed by more than three years. So it won’t be until 2017 at the earliest that NASA can end its total dependence on Russia’s Soyuz. A sensible policy to eliminate US dependence on Russia would be to accelerate CCP, not cut it to the bone, especially in view of the Crimean crisis which remains unresolved as of this writing. If U.S. access to Soyuz seats were to be cut off, the implications would be dire and it could mean the end of the ISS. When NASA Administrator Chales Bolden was asked about contingencies at a briefing yesterday, March 4, he responded that everything is OK for now. “Right now, everything is normal in our relationship with the Russians,” said Bolden. “Let me be clear about one thing,” Bolden said. Now let’s examine a few American rockets which include substantial Russian and Ukrainian components – without which they cannot lift one nanometer off the ground. The Atlas V first stage however is powered by the Russian built and supplied RD-180 rocket engine. Several Air Force – DOD satellites are launched on the Atlas V every year. Many NASA probes also used the Atlas V including Curiosity, MAVEN, Juno and TDRS to name just a few. What will happen to shipments of the dual nozzle, dual chamber RD-180’s manufactured by Russia’s NPO Energomesh in the event of economic sanctions or worse? It’s anyone’s guess. ULA also manufactures the Delta IV expendable rocket which is virtually all American made and has successfully launched numerous US national security payloads. The Antares rocket and Cygnus resupply freighter developed by Orbital Sciences are essential to NASA’s plans to restore US cargo delivery runs to the ISS – another US capability lost by voluntarily stopping shuttle flights. .
Orbital Sciences and SpaceX are both under contract with NASA to deliver 20,000 kg of supplies to the station. And they both have now successfully docked their cargo vehicles – Cygnus and Dragon – to the ISS. The first stage of Antares is built in Ukraine by the Yuzhnoye Design Bureau and Yuzhmash. And the Ukrainian booster factory is located in the predominantly Russian speaking eastern region – making for an even more complicated situation. “In light of Russia’s de facto annexation of the Ukraine’s Crimea region and the formal severing of military ties, the Atlas V cannot possibly be described as providing “assured access to space” for our nation when supply of the main engine depends on President Putin’s permission, said Space X CEO and founder Elon Musk, at the US Senate appropriations subcommittee hearing on Defense. So, continuing operations of the ISS and US National Security are potentially held hostage to the whims of Russian President Vladimir Putin. The Crimean crisis is without a doubt the most dangerous East-West conflict since the end of the Cold War. Stay tuned here for Ken’s continuing Orbital Sciences, SpaceX, Orion, commercial space, Chang’e-3, LADEE, Mars and more planetary and human spaceflight news. Final Space Shuttle liftoff marks start of US dependency on Russia for human access to space.